*About Shipment* If the goods are not by "Fulfilled by Amazon" all the parcels are shipped by USPS or Canada post or the local country postal service internationally. Normally it takes 5~12business days(except weekends) to arrive with tracking number,you can track it from the website of www.usps.com or www.canadapost.ca or the local country postal service internationally in detail.The estimated shipping time is not guaranteed because the real shipping time is depends on Delivery of local postal courier and customs processing progress. Feel free to contact us if necessary. Thanks. WHAT YOU GET - Professional Packaging Transport Cost-effective Goods and Friendly Customer Service. Great Choice For Every Days. 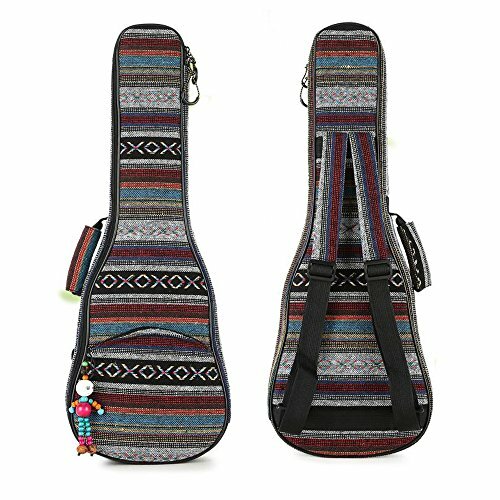 ✔ PERFECT ADAPTATION - Size 23/24in ukulele case: Length 65cm* Width 23cm* Height 8cm. suitable for Concert ukulele. Please Check The Size of Your Choice!!! ✔ STRONGER PROTECTION - Exquisite Knitted Fabric Thickness 10MM cotton added for protect. Sponge handle double metal zipper. ✔ PORTABLE DESIGN - Backpack Shouldes Design It Uses High-density Woven Comfort Material. Big Pocket Can Accommodate Many Small Accessories. ✔ PROFESSIONAL BRAND - We are So Confident You'll Love Our Ukulele Cases, Please Believe the Strength of The Focus. Beat That. ✔WHAT YOU GET - Professional Packaging Transport Cost-effective Goods and Friendly Customer Service. Great Choice For Every Days. If you have any questions about this product by HOT SEAL, contact us by completing and submitting the form below. If you are looking for a specif part number, please include it with your message.